Designed to deliver a thrilling sonic experience, the NR1508 AV Receiver features expanded connectivity including built-in HEOS wireless multi-room audio technology, to enable you to enjoy your favorite music anywhere and everywhere around your home. You can explore and play music from your own music library, from online streaming music services, and from thousands of Internet radio stations using the free HEOS app for smartphones and tablets, with high resolution audio fully supported for incredible fidelity. 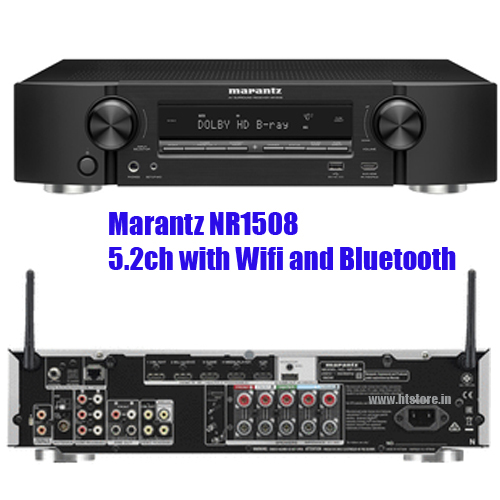 The NR1508 also features Bluetooth and AirPlay compatibility to stream music directly from any compatible device. For high resolution surround from your favorite movie soundtracks the NR1508 is equipped with advanced 32-bit DSP processing supporting all the major sound formats, including Dolby TrueHD and DTS-HD Master Audio. Its power amplifier section features high current discrete power transistors and identical circuit topology for all 5 channels, and is compatible with low impedance 4 ohm speakers. The video section features 6 HDMI inputs (including 1 on the front panel), with full compatibility with the latest 4K Ultra HD video specification, including 60 Hz full rate content, 4:4:4 Pure Color sub-sampling, BT.2020, HDR and Dolby Vision compatibility. It's also HDCP 2.2 compliant, for 4K Ultra HD copy-protected content. HLG (Hybrid Log Gamma) pass-through for future HDR broadcast content will be supported via a firmware update. 5-channel discrete power amplifier, 50W per channel (8 ohm, 20 Hz – 20 kHz, 0.08% THD). 6 HDMI inputs (incl. 1 front) with full HDCP 2.2 support. Dolby TrueHD and DTS-HD Master Audio. The NR1508's power amp section features discrete high-current output devices for superb sound with both music and movies, with, identical power on all 5 channels for precision sound. Rated at 50 watts per channel (8 ohm, 20 Hz – 20 kHz, 0.08% THD), the NR1508 features low-impedance drive capability, for excellent speaker control, and is compatible with 4 ohm speakers too. Meanwhile the Eco mode provides energy savings: it features an on-screen Eco meter, while it’s also possible to use the receiver in power-saving mode, either reducing the maximum output power or adopting low-power strategies at more modest settings – and all without any effect on the superb sound quality. Six HDMI inputs – including one on the front panel for quick connections – feed the NR1508's advanced video section, supporting the latest HDMI specification, including 4K Ultra HD 60Hz video, 4:4:4 Pure Color sub-sampling, BT.2020 and HDR pass-through support on every input. Dolby Vision compatibility is now supported, too, along with pass-through for new HDR broadcast format HLG (Hybrid Log Gamma) to be enabled via a future firmware update. The NR1508 is equipped with an advanced dual antenna system for Bluetooth and Wi-Fi streaming, for a robust connection even in congested urban environments. Apple's AirPlay lets you listen to your favorite tracks wirelessly from iOS devices such as iPhones and iPads. Multiple streaming services can be played on the NR1508 or any other connected HEOS devices, including Pandora, Spotify, TuneIn Internet Radio, Amazon Music, SiriusXM, iHeartRadio, Sound Cloud, Tidal, Napster or Deezer (*). You can also stream music from your phone, USB stick, or local network drives, with favorites and playlist functions supported. Using the measuring microphone and stand supplied, Audyssey MultEQ measures the speakers in your home theater, including the subwoofer, and then applies multiple high precision DSP room acoustic correction filters, providing the smoothest, most natural tonal balance - regardless of the brand(s) or model(s) of speaker. Audyssey Dynamic EQ features advanced psycho-acoustic processing to deliver clear dialogue and wide-band response even at reduced volume levels, delivering cinema-level clarity whatever listening level you choose, while Audyssey Dynamic Volume avoids nasty shocks by normalizing volume when content switches to commercials or announcements, creating an easier listening experience.